Border guards catch Arabs attempting to transfer 9,000 eggs over security fence and into arms of waiting Israeli accomplice. 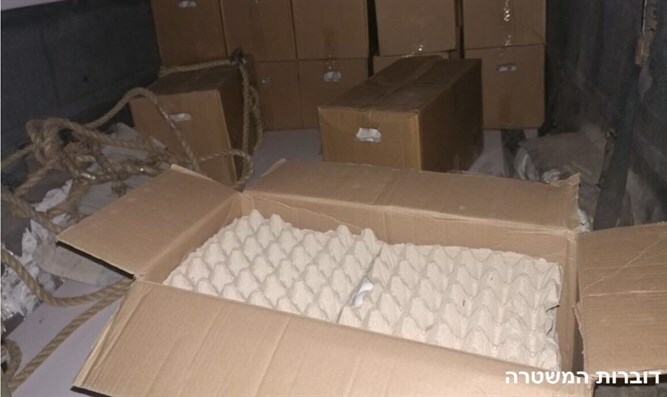 IDF border guards on Friday night arrested two Arabs whose vehicle contained 9,000 unsupervised eggs. The two Arabs, who were caught near the Jerusalem-area Palestinian Authority town of Al-ram, were intending to smuggle the eggs over the security fence and into the waiting arms of an Israeli accomplice. A search of the Arabs' vehicle revealed ropes and other climbing equipment. The eggs were confiscated and transferred to the proper authorities, while the smugglers, both in their 20s and residents of the Arab town of Qalandiya, were transferred to the Agriculture Ministry's Unit for Enforcement and Investigations. "We have seen several attempts to smuggle people over the fence, but we have never seen an attempt to smuggle such a large quantity of goods over the fence," Israel Police said. "The more sophisticated their strategies get, the more sophisticated our intelligence, strategies, and responses become." "We will continue to invest in preventing and foiling any attempt to smuggle goods or people into Israeli territory, whether the smugglers attempt to evade our personnel or attempt to find sophisticated methods of passing goods over the security fence."